The coastal geology around the Seven Heads peninsula, County Cork provides excellent exposures to rocks of Upper Devonian to Namurian (Carboniferous) age. The peninsula is traversed by an complex faulted east-west trending syncline. The study area is located on Quarry Point, a headland on the eastern side of the Seven Heads peninsula, situated on the south side of Broadstrand Bay. This area lies at the southern onshore extent of the Variscan tectono-sedimentary Rhenohercynian zone of southern Ireland and consists of a folded sequence of deepmarine siliciclastic rocks belonging to the Serpukhovian White Strand Formation (Higgs and Forsythe, 2007). Shear folding, which is also referred to as slip folding, involves shear along planes that are oriented approximately parallel to the axial plane of the fold structure. These planes, which are typically axial-planar cleavage planes, facilitate high-angle reverse slip leading to fold limb rotation and amplification. 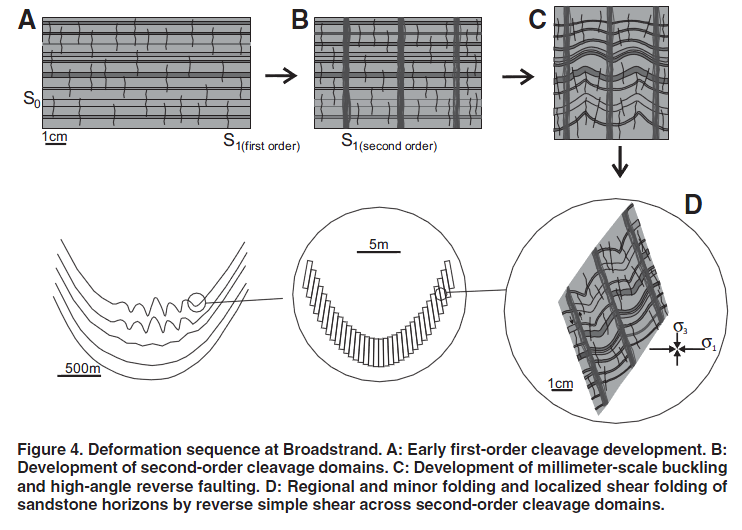 Analysis of folded marine sedimentary rocks from the Variscan of southern Ireland at Quarry Point provides unambiguous microstructural evidence for reverse shear on chemically weakened cleavage domains. Significant silica loss in these cleavage domains, and as a consequence marked mechanical weakening, is seen as the primary cause for the reverse slip associated with the shear folding of these sedimentary rocks. Layer shortening (parallel to bedding). Slaty cleavage develops in mudstone, and 1st order cleavage in sandstone. Regional (e.g. Broadstrand Syncline) and minor folding. High-angle reverse shearing in sandstone.